I have been in love of this Main, Natural and third lately, it flows just so absurdly well for the ideas i have had these last few months that it would basically be a crime to use another set up, but everything has to come to an end, even my love for these kind of set ups, this will be probably the last map i'll be publishing for a while that has those because even of they flow right in some kind of layouts they are also constricting for other kind of ideas. Neo Gobi is a map that's based of the Gobi Desert just as the name implies, such a magic place where it is not weird to find snow in the cold seasons even when the place is a huge sandy desert, the openness i tried to keep in the map comes from the idea of fighting in a desert where there are few terrain landmarks, nonetheless every starcraft map must have at least some, otherwise the balance of the map would be very Zerg friendly to say the least. But without adding more ramble, here you have it, my January map, KTV Neo Gobi. § Two central high grounds have Line of Sight blockers on top. § Lack of central Xel'naga watch tower means that players must be aware of the enemy army at all times, central high grounds allow for surprise flanks. § 4 o-clock fourth has huge diagonal 2000hp/3 armor rocks that must be first destroyed in order to allow medium range units harass the mineral line. § Blink stalkers can access the 1 and 7 corner bases without the need of an air unit. § Natural counter clockwise expansion pattern allows players to take the gold base as their fourth while being defensive, if players want to take the counter-clockwise expansion pattern then they must be aggressive, but they will be rewarded by being able to take the corner base by destroying a set of rocks and being able to take the more central 7 and 1 bases while denying the enemy of their own more defensive fourth. § Map allows blink stalker allins to be strong, if it happens to develop into a problem it can be easily altered. 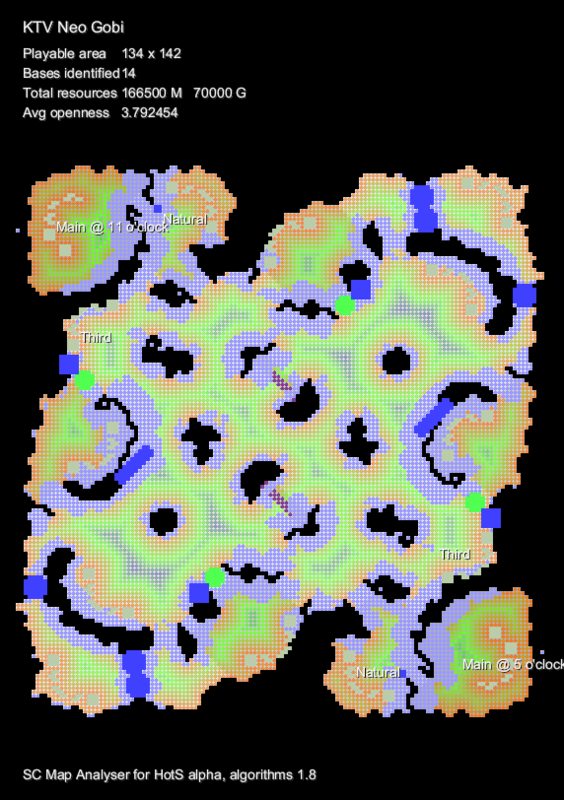 This map has some particularities, first Blink allins are quite viable on the map, even when blink allins are shunned, they are still a valid strategy, with this map i'm trying to find an optional way to make them viable in certain layouts without needing to resort to the Mutiny or Catallena approach of using a big patch of unpathable terrain in front of the main base. Nonetheless this may have consequences, it is fairly easy to secure fourth bases on the map since the natural ramp that leads toward the center is quite small for big armies, i'll have a keen eye if the map develops badly in that regard and do the necessary changes. I would love to hear feedback in this regard, how easy would it be to secure 4 bases, and blink stalker allins in today's meta. The map should play out quite standard. I'm a bit worried about blink too nevertheless, map needs to be playtested in that regard. I'm less worried about the 4 bases stronghold part. Not digging the look, looks like a icy Edmonton streat. But might play well, and that's most important.
? You can properly wall on the previous ramp I think. He means the flow of it, the way the Main, gives into a lower Natural, the nat does the same to the third and the third gives path to a high ground fourth, or at least that's the way i see it. Map seems excellent. Great knowledge of how to space the middle area, not too chokey. I'm not a fan of the Daedalus-esque flow tbh, and I also don't really get the point of the double corner bases. I don't really dig the very narrow space in front of the natural either ; feels like it will make any Zerg army trying to attack a 2-base Protoss/Terran run away in fear seeing how easy the T/P will defend. Apart from that it's a sick map, but I expected no less from you. I like the middle and the flow of the map past 3-bases. The aesthetics are beautiful ; it didn't strike me at first but the more I look at it the more I realize how precise and well made they are. , i'll probably mess around with it and then make some changes, also depending in how the ramp that comes from the natural and leads to the center behaves in PvZ with allins i may try to make the area wider. My biggest issue atm is that i'm starting to focus on the TLMC quite a bit, and this will mean that i won't have much time for messing around and test things, so in the worst possible scenario i'll end up doing the changes after the TLMC is over. Any specific reason for that? I find the Dedalus flow to be quite nice and easy to work with. Also the corner bases are quite interesting imo, i haven't seen set ups like this one well, ever, not even BW, and i'm looking forward to the games.